This coming Black Friday there will be deals on gaming, SteelBooks, DVD & Blu-Ray, Clothing, Tech and more. If you are not refreshing this page in November then you are sadly going to miss some amazing deals of the year. Not only will there be price drops on PS4, Xbox One games etc there will also be discount codes popping up now and then on this page. If you have a great Zavvi deal or a discount code to share then please do so in the comments below. Maybe you would like to see price drops on Star Wars gear, FIFA 17 or even maybe a PS4 Pro bundle. Are you looking forward to the Zavvi Black Friday UK Sale? 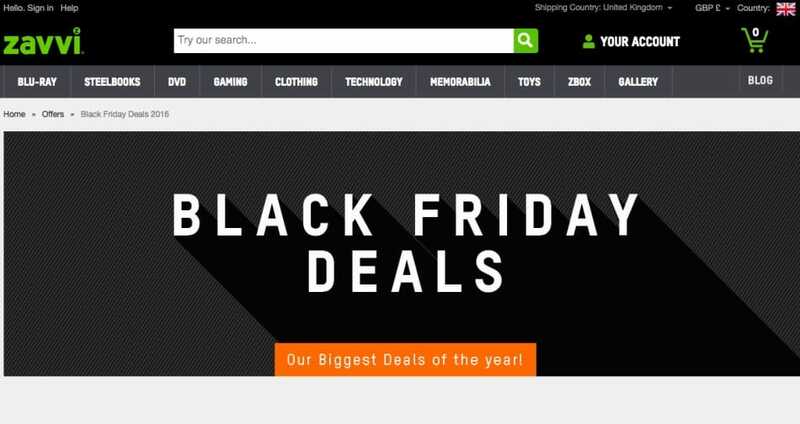 You’ll be able to see all the Zavvi special discounts on their Black Friday offers page. Save 10% on fancy dress costumes right now when adding the discount code FD10. The Zavvi Black Friday Deals 2016 will start at 12am November 25. The PlayStation VR is the new Virtual Reality system for PlayStation 4 and is releasing this month, so there is a slight chance we could save money on Black Friday – Give a sitewide Black Friday 30% saving. Please release the PS4 Pro on Black Friday, that would be a selling point and half. I would very much like to see the price drop on a new PS4 Pro, say knock off like £80 and throw in a game or two.